On the surface, Lent might seem like a quiet time for Altar Guild. The purple paraments remain in place and there are no flowers in the church. But actually, we have been busy since before Ash Wednesday planning and preparing for Holy Week. Volunteers have been lined up for setup before and cleanup after each service. Palms have been ordered for Palm Sunday. 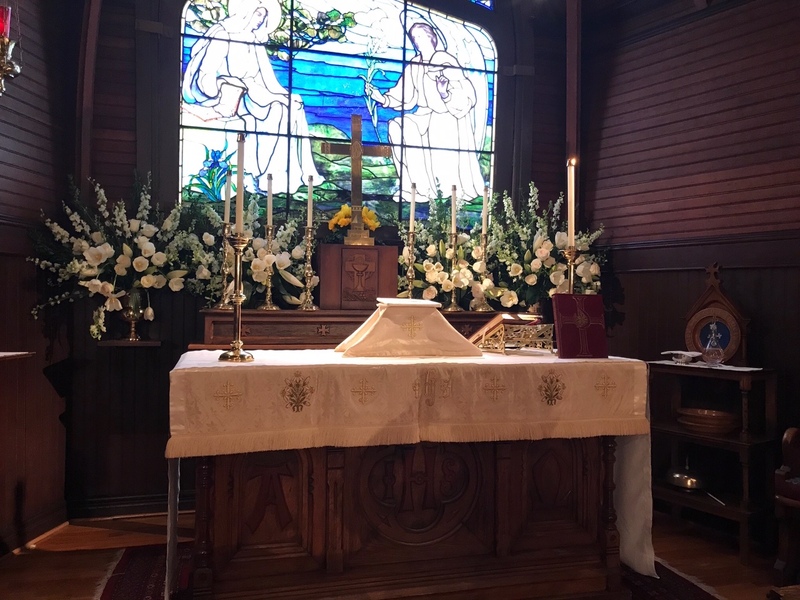 On Good Friday, a crew will be going to Watsonville to pick up the best available plants and flowers, to be arranged in the church over the course of about 4 hours that Saturday morning. 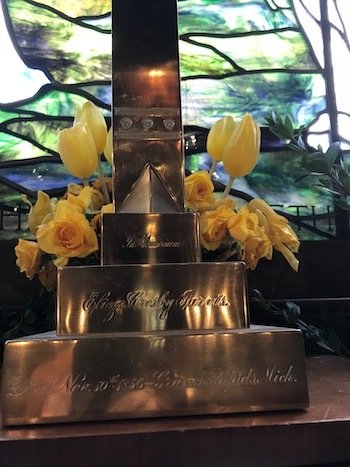 All the brass is being polished, and all the linens cleaned to perfection, so that on Easter Day the church looks its best as we celebrate our risen Lord. If you’d like to be a part of this ministry, let any of the Altar Guild members know of your interest. You’ll be teamed up with at least two experienced members to set up the church one Saturday per month and clean up the next day after the 10:00 service. In a short time, you’ll learn everything you need to know. If you’d like to take home one or more of the beautiful potted white Easter lilies, they are available for a $25 donation. Please put in your request early, so that everyone who wants one is able to get one. Or, if you’d like to donate toward the magnificent floral arrangements on each altar, your contributions will be welcome. The Altar Guild relies primarily on contributions for the purchase of flowers. Just include your donation in the collection plate with a memo indicating it’s for flowers and/or for potted Easter lilies.